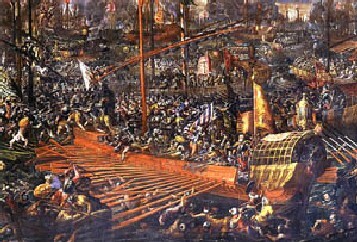 Descriptions of the Battle of Lepanto based on the Catholic chronicles of the time do not mention an important fact found in the Muslim sources. The latter report that at a certain moment during the battle when the Catholic forces were being defeated, the Turkish fleet saw a majestic and terrible Lady in the sky. She was looking at them with such a menacing gaze that they could not bear it, lost their courage, and fled. The battle taking place was the greatest naval battle in History to that date, and all Christendom waited in understandable suspense for its outcome. In a certain sense, the future of Europe was being decided there. Protestantism had created a fracture in Christendom, and religious wars were springing up everywhere. Because their forces were needed on various fronts, the Catholic nations probably could not have faced a Muslim invasion into southern Italy, which would have been the normal consequence if the Battle of Lepanto had been lost. If Italy were invaded, in a short time the Pope would have been forced to leave his Papal Territories to avoid becoming a prisoner. Most probably, no one would have been able to stop the Turkish impetus into Western Europe. 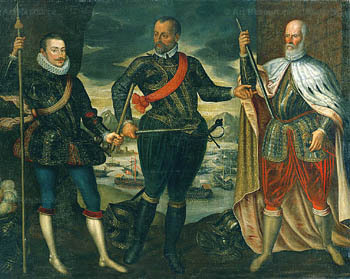 In that immense battle, three Catholic powers were involved: Spain, the most powerful nation of the time; Venice, which was very wealthy and had a considerable naval force at that time, and Genoa. There was also a small papal fleet, everything Pope Pius V could muster together to add his material strength to face the common enemy. In this atmosphere of general suspense, the battle took place. Descriptions of the time report how terrible it was. Catholic soldiers were jumping onto Muslim ships; Turks were entering Catholic vessels – one side killing another with tremendous carnage. Ships were sinking here and there; soldiers and knights in armor floated briefly in those turbulent waters, then sunk into the depths to meet death. Canons roared, shouts of rage and despair were heard above the din; a terrible uproar and enormous turmoil everywhere. 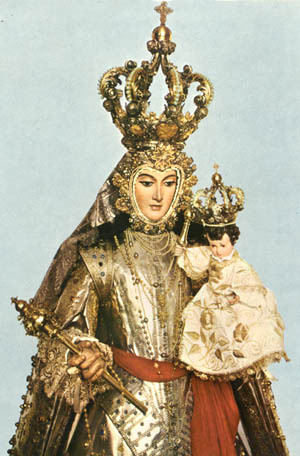 Amid all that confusion, two men were praying to Our Lady to give the victory to the Catholics: on those turbulent waters, there was Don Juan of Austria, the commander of the Catholic Armada; and in Rome, there was St. Pius V.
You can imagine the profound calm and great self-control necessary for a man who, in the apex of the battle with men fighting on all sides of him, could nonetheless discern the general line of the battle and note that it was going badly, even though the Catholic soldiers were fighting as well as possible. Then, remembering the teachings of our Faith, he determined to fight to his last breath of life for the cause of Christendom, still with the hope that Our Lady would intervene. That is to say, a person like this – and such a person was Don Juan of Austria – trusted against all trust. Against all human possibility, he expected Our Lady to intervene. In fact, she did intervene. She appeared in the sky to threaten the enemy, and the Mohammedan navy fled. But the Catholic warriors did not see her. She did not appear to them. The Catholics had the merit of practicing a blind confidence, a pure act of faith. Only when the enemy later reported the miracle did they realize that she had helped them in the worst hour. The Catholic knights, principally those in command who perceived the general line the battle was taking, had to seriously consider that they would either die or be made prisoners and slaves of the Turks as a consequence of their defeat. But they trusted in Our Lady that she would prevent the cause of Christendom from perishing. This represented an extreme confidence on their part. At that same time, St. Pius V was also praying at the Vatican. He was in a meeting about Vatican financial balance sheets, an important matter since it implied mortal sin should someone have stolen money from the Church. Therefore, St. Pius V had to vigilantly analyze the figures to avoid being an accomplice to such a sin. Suddenly he stood up, probably moved by a supernatural inspiration, and went to the window of the room to pray the Rosary. As he prayed, he received a revelation that Don Juan of Austria had won the battle. He returned to the table and said: "It is not time to talk about business; our great task at present is to thank God for the victory He has just given the Catholic Armada." Then, in a few days, a messenger arrived and gave the official report. The Pope listened attentively to the account, without any agitation, with his customary grandeur and benevolence. Then, a great feast was celebrated in Rome, the bells of all the Churches of the Eternal City rang. From Rome the news spread to all Italy, and then to all Christendom. This was the great joy for the victory of Lepanto. Is there an application for us? What was the greatest heroism of the knights of the battle of Lepanto? It was not the courage to face the Turks. Certainly, to face enemies in a battle one needs courage, but you can find such courage in all battles of History. In my opinion, the greatest heroism of those Catholics who fought at Lepanto was the heroism of believing that the battle would be won by Our Lady at the moment when everything seemed lost. That act of confidence was not an imprudent or unwise act, a kind of resignation to accept whatever would happen. It was an act of fidelity to a certain interior voice of grace that invited each one to confide and pray that she would give the victory. The good cause throughout History often finds itself in a situation similar to the Catholics at Lepanto. Everything seems lost humanly speaking, but Our Lady puts in our souls a hope that she will win the battle for the greater glory of God. Then we need to trust this voice against all probabilities and appearances to the contrary. Is there any criterion to know when an interior voice comes from Our Lady or not? Yes, there is. When the perspective of some future thing leaves us depressed, discouraged, and with the desire to give up, then this outlook normally comes from the Devil. On the contrary, if the perspective of doing a very difficult thing that would normally cause fear, nonetheless produces enthusiasm, gives us strength to practice virtue and inspires us with the hope of victory in an almost impossible situation, then probably it is the voice of the grace speaking in our souls. Does grace act only this way? No. Often grace inspires resignation. Our Lady can ask us to be conformed to a defeat. Then she gives us strength to endure the suffering of the defeat. St. Therese of Lisieux, for example, received such a grace to prepare herself for death, and afterward, she went to Heaven. The two perspectives are different. When Our Lady wants to give a victory, she prepares us for that, and not for death. 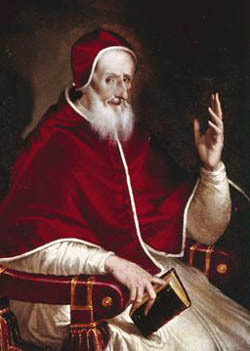 The great St. Pius V had heard the same interior voice as the knights of Lepanto. In this case, the words of Our Lord apply: “My sheep hear My voice, and I know them, and they follow Me” (John 10:27). The voice of Our Lady speaks to our souls and tells us firmly: “Catholic Civilization will be restored, the Reign of Mary will be established on earth.” This is the voice that gives us courage to fight against all the enemies, in the worst of conditions, and all alone. There is no doubt that this voice is authentic. What happened in Lepanto with those knights and soldiers will also happen with us. 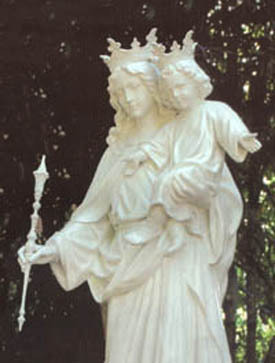 We will have the victory of Our Lady. This is, in my opinion, the interior message Our Lady Help of Christians gave in that battle, and gives us today. Let us ask her to give us the necessary graces to be faithful to it.